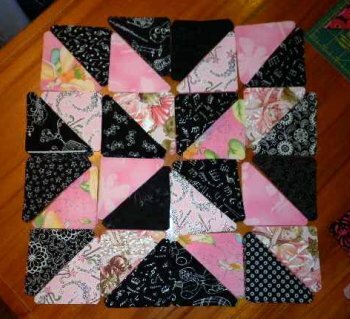 Emmy's half square triangle quilt was a quilt I made from my quilting stash and scraps. 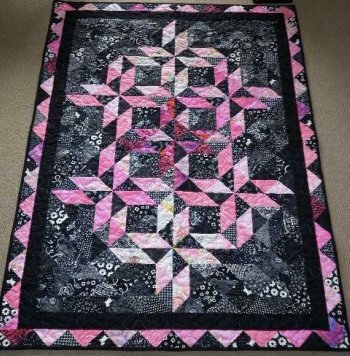 I decided to make my life easy and create this quilt using Marti Michell's triangle from her template A set. I am so pleased with how it turned out. Emmy was so enthusiastic when I gave it to her that she lay on it immediately! This quilt is going on her bunk bed so it sits flat on the top of the mattress with no tuckin. 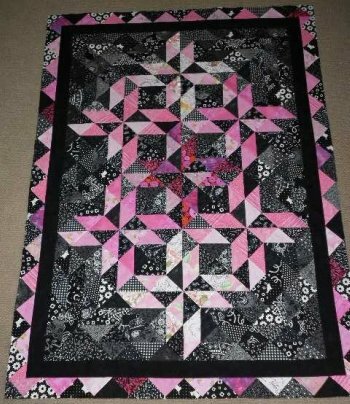 For the reverse of the quilt I used a fairy panel and made the border from fabrics strips I didn't use on the front. Emmy, who was 5 when I gave this to her uses the fairy side as the front of the quilt! I knew she would! But as she gets older and grows out of fairies then she can use the pieced triangle side as the front. I hope she doesn't grow out of pink! 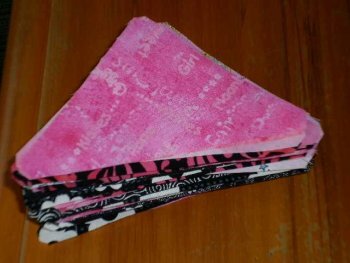 Below is a brief tutorial showing how I made this half square triangle quilt. 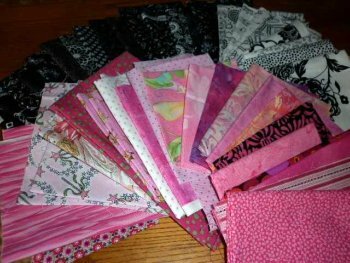 Here is the selection of fabrics I choose from my stash. I cut strips 3 1/2" wide. Using Marti Michell's triangle template from Set A I Cut out a lot of triangles. 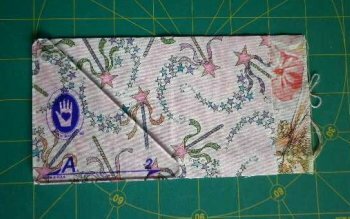 I love Marti Michell's templates because they remove the surplice corner fabric and this makes lining up the triangles so easy and accurate. No pinning necessary! Here's all my triangles. I layed out several similar length strips and cut multiple triangles at a time. The most strips I did this with was 6. Now for the fun part! 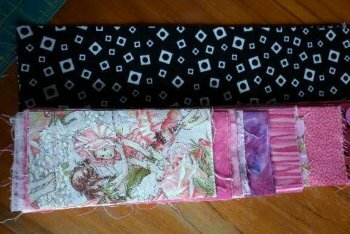 I trialed fabrics until I got a set that I liked together. The following are 3 of the blocks layed out ready for sewing. I made 7 blocks in total. To assemble each block you first join triangles to make a square. Next you sew the squares together in rows. Lastly you sew the rows together. 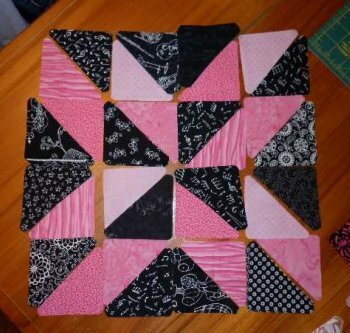 Once the 7 blocks were layed out in a desirable format I then made up several triangular blocks from the black leftover triangles. 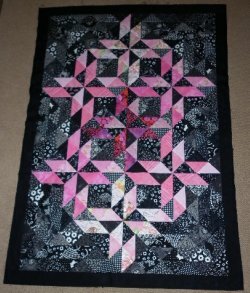 I love this stage, when you can finally view the quilt top taking shape. For the border I decided to piece together some of the surplus triangles I had. 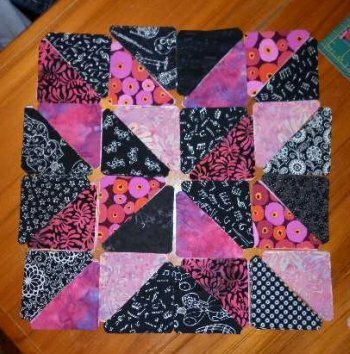 Once in place it didn't look good so I added a black border first then the pieced triangle border. I love the way the corners worked out. A very welcome surprise!